GSA member Yoshinori Ohsumi has been selected as the recipient of the 45th Lewis S. Rosenstiel Award for Distinguished Work in Basic Medical Research. Established in 1971 at Brandeis University, the award is an expression of the conviction that educational institutions have an important role to play in the encouragement and development of basic science as it applies to medicine. 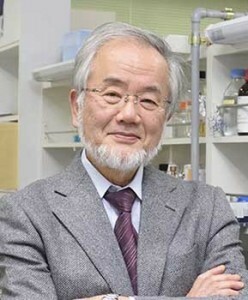 Dr. Ohsumi is honored for his work in elucidating the process of autophagy, an essential cellular process to degrade defective or unnecessary cellular components by sequestering and transporting them into the lysosome or vacuole. Although the lysosome was first identified in the 1950s, it was not until Dr. Ohsumi’s work that the many protein components of this degradative machine were identified. Using budding yeast cells as a model system, Dr. Ohsumi and his colleagues identified mutations in most of the genes encoding the proteins of the core autophagy machinery. Subsequent work delineated how autophagy is regulated, through a central protein kinase, Atg1. A critically important discovery was the role of a ubiquitin-like protein, Atg12, whose transfer to Atg5 is essential for autophagy, both in yeast and in human cells. In addition Ohsumi’s lab described a second ubiquitin-like protein, Atg8, whose processing surprisingly involved its conjugation to a membrane phospholipid. Still another key finding was the identification of Atg9 as a membrane-spanning protein that is essential for the formation of autophagosome structures that are taken up into the vacuole. Dr. Ohsumi will present a lecture at Brandeis University on his award-winning work on April 6, 2016, followed by a dinner honoring the Rosenstiel Award recipient. He has been honored with several other awards in recent years, including the 2015 Canada Gairdner International Award, 2015 International Prize for Biology from the Japan Society for the Promotion of Science, 20th Keio Medical Science Prize, 2012 Kyoto Prize, and 2008 Asahi Prize. A number of GSA members have been honored with the Rosenstiel Award in past years, including several who went on to receive the Nobel Prize.